Jumper in King Cole Moods DK: Finished! 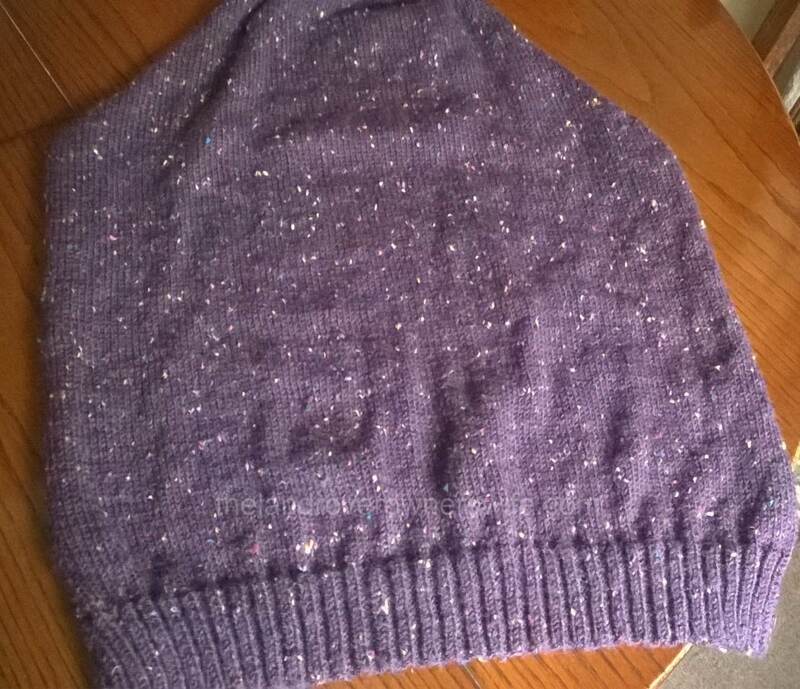 My finished jumper. Just needs a warm iron and damp cloth. 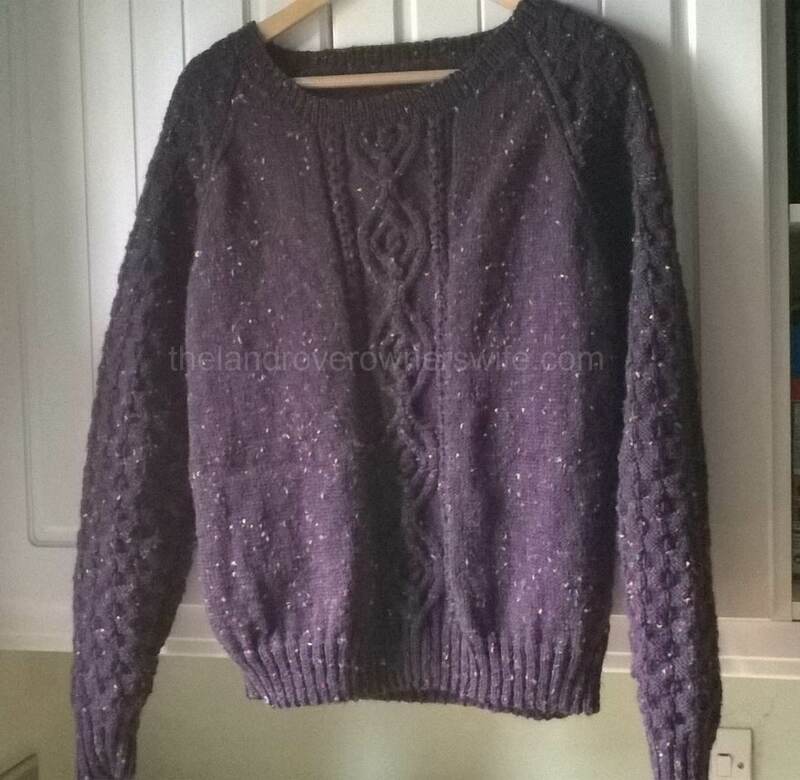 I finished my jumper and I love the look and feel of it. I only need to block it, although due to the nature of the pattern I will probably do this with the use of a warm (not hot) iron and a damp hanker-chief, as there is no intricate lacework involved with this pattern at all. Categories: .... on knitting, Ladies knits | Tags: clothes, crafting, fashion, James C Brett JB179, King Cole Moods DK, knitting, wool, yarn | Permalink. I think that the pattern works really well with this colour. I’m really enjoying working with this yarn and the pattern on the sleeve has helped ensure that the monotony that can often accompany the knitting of full length, adult sleeves is alleviated to some degree. The check pattern works really well with the dark colour and the stitch increases (to develop the shape and body of the sleeve) and decreases (for the raglan top) have, not surprisingly, been easy to incorporate into the pattern. Categories: .... on knitting, Ladies knits | Tags: crafting, home makes, James C Brett JB179, King Cole Moods DK, knitting, wool, yarn | Permalink. 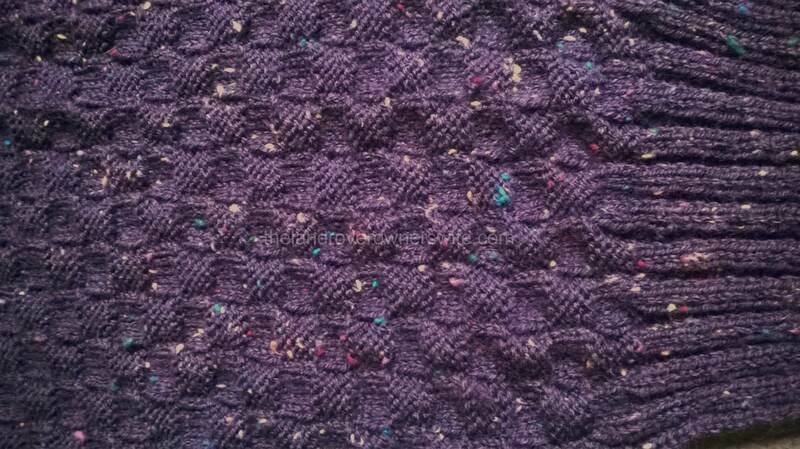 When I chose this particular pattern, I did so based on the lovely cable panel than ran up the centre of the front section. Having just completed a couple of projects which were primarily stocking stitch, I found the idea of a more complicated cable pattern appealing and the fact that this was balanced with panels of stocking stitch on either side, meant that it should be ideal for this time of the year when the garden is slowing down but does still require some work and the nights are drawing in, reducing available day light hours to potter about in. 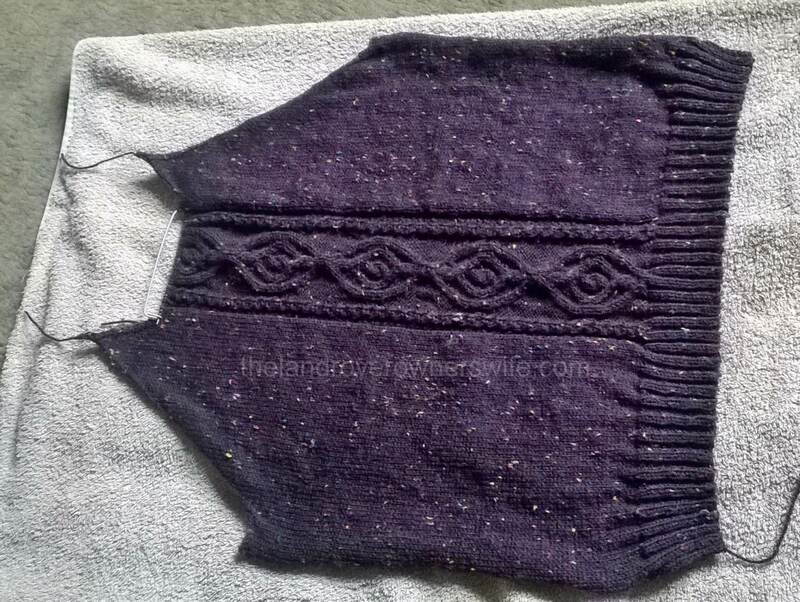 Although there wasn’t a picture of the back of the jumper on the pattern leaflet, the fact that the sleeves were also patterned, albeit differently to the front, led me to think that the back would also be patterned and so, with that and bearing in mind my love of knitting cable patterns, the pattern was ordered and so was the yarn. Categories: .... on knitting, Ladies knits | Tags: crafting, Damson, home makes, James C Brett JB179, King Cole Moods DK, knitting, wool, yarn | Permalink. 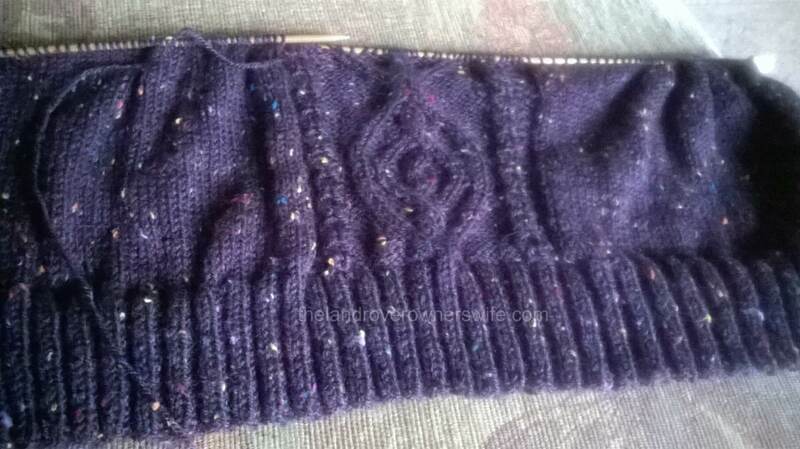 Jumper in King Cole Moods DK: the front … and some giant piranah! With the girls safely tucked up in bed and the dishes finished, I sat down, picked up my knitting and got to work finishing off the front section of my jumper. I only had a few more rows to complete before I needed to make the turn for the neck section and I wanted to make a start on the back rib. Beside me, Mud had been browsing through his forums, blog and Ebay pages but when the program I had been watching/listening to finished on the television, he picked up the remote and flicked the guide pages on. Categories: .... on knitting, Ladies knits | Tags: crafting, Films, horror films, James C Brett JB179, King Cole Moods DK, knitting, wool, yarn | Permalink. The first panel of pattern completed. I love this yarn and the pattern. The colour is fabulous especially with the multi-coloured specks which are dotted about. The yarn itself handles nicely and has a soft feel about it. The waistband for this garment is a 2×2 rib which gives the waist a little more shape than a standard 1×1 rib. Categories: Ladies knits | Tags: crafting, Damson (802), home makes, James C Brett JB179, King Cole Moods DK, knitting, wool, yarn | Permalink. With the nights drawing in, I have found myself at a loose end on an evening, especially those nights when Mud has been working late. So I started to look for a project, this time for me and, after much searching and deliberation, I settled on this James C. Brett pattern for a sweater and hat. The jumper features patterned sleeves and a gorgeous looking panel of cable going up the center of the front piece (and I’m assuming the back). Categories: Ladies knits | Tags: crafting, home makes, James C Brett JB179, King Cole Moods DK, knitting, wool, yarn | Permalink. Who’s been eating the Vine Weevil Grubs? Holiday List Item 4 (and teensy bit of Item 5) – Tick! Holiday List Item 2 – Tick! Holiday List Item 1 – Tick! Who's been eating the Vine Weevil Grubs?